The Lycoming 1,400 shp (1,000 kW) T53-L-13 with a four stage turbine. The Lycoming T53, (company designation LTC-1) is a turboshaft engine used primarily on helicopters, but also fixed-wing turboprop aircraft. It was developed in response to a 1952 Air Force request for a 500 to 700 shaft horsepower (shp) (373 to 522 kW) turboprop engine. It was designed by a team headed by Anselm Franz at the Lycoming Turbine Engine Division in Stratford, Connecticut. Anselm Franz was the chief designer of the famed Junkers Jumo 004 that powered the world's first operational jet fighter, the Messerschmitt Me 262. Lycoming is most noted for producing a series of four and six cylinder engines for light aircraft. 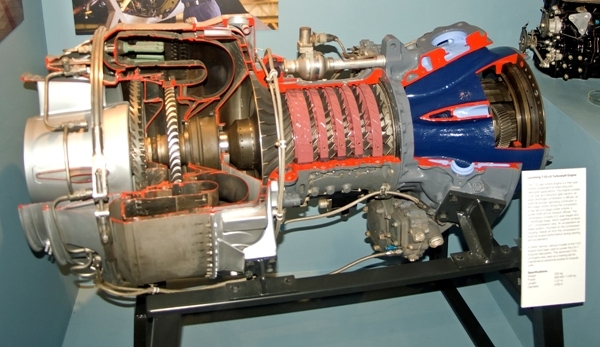 The T53 gave Lycoming its start in the aircraft gas turbine business. 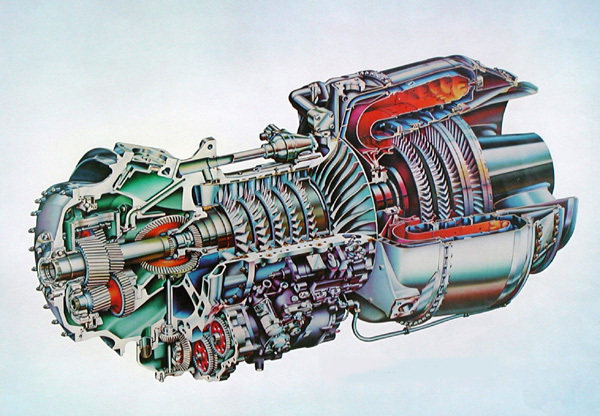 The T53 was first delivered in 1959 and used a front-drive, concentric-shaft arrangement with a single spool five-stage axial compressor and sixth-stage centrigugal flow compressor. The compressed air then flows to a reverse flow combustor to a double spool, four-stage, axial-flow free turbine. The High Pressure (HP) turbine drives the compressor and accessory gearbox, while the Low Pressure (LP) turbine drives the output gearbox. The engine contains two gearboxes. The output gearbox on the cold end to drives the main rotor, the N2 governor, the N2 tach generator and a torquemeter. The accessory gearbox drives the starter/generator, oil pumps, fuel pumps and fuel control. Intake air flows around the output gearbox into the compressor section. The compressor contains variable inlet-guide-vanes to provide more efficient air flow and to improve acceleration. Air is bled from the compressor fourth and fifth stages to prevent compressor stalls, increase acceleration and to provide anti-icing and cabin air. The compressor discharge air is fed to a reverse flow annular burner can containing 22 fuel nozzles. The Lycoming 825 hp (615 kW) T53-L-9 with a two stage turbine. The heated high pressure gas is expanded through the HP turbine, to drive the compressor and the accessory gearbox, and then through the LP turbine to drive the output reduction gearbox through a coaxial shaft. The LP turbine shaft rotates inside the center of the HP turbine shaft to the output gearbox. The output gearbox reduces the LP turbine speed from 22,500 rpm down to 6,640 rpm. The multiplying torque factor is 3-1/2. Theoretical peak torque for this engine is on the order of 2,200 lb/ft, but the gearbox is limited to around 1,700 lb/ft. The engine exhaust escapes through a large diameter diffuser at the rear of the engine. The first Lycoming T53-L-1A engine produced 700 shp (520 kW). Further development led to the T53-L-5 and produced 960 shp (720 kW).1 The T53-L-11 produced 1,100 shp (820 kW) and the T53-L-13 produced 1,400 shp (1,000 kW). The latest version of the T53, the T53-L-703, is rated at 1,800 shp (1340 kW). The first production T53-L-1A engine powered the first Bell UH-1A Iroquois (Huey), the and AH-1 Cobra helicopters and the Grumman OV-1 Mohawk airplane. The higher power T53-L-13 engine began deliveries in August 1966 and powered the Bell HU-1C/D/H Iroquois, Bell AH-1G Cobra and U.S. Air Force Kaman HH-43B helicopter. More than 19,000 T53s have been delivered and is now produced by Honeywell Aerospace. 1. Stephen Harding. U. S. Army Aircraft Since 1947. London: Airlife Publishing Ltd. 1990. 40.